No father - especially an immigrant from China - says to his daughter, "Please, marry an artist." Rooted in the telling of one family's life, The Chopsticks-Fork Principle: A Memoir and Manual by Cathy Bao Bean is a story for all families. In this humorous and poignant memoir, the author, an immigrant from China, recounts how she figured out how to be herself, as well as raise a son whose artist father did things like paint the lawn. As Cathy Bao Bean attempts to satisfy disparate cultural norms, she provides us with a unique window into the experience of a bicultural family. The Chopsticks-Fork Principle is also a manual that explains how anyone who steps outside the home can benefit by greater awareness of the diversity within and around us. For more details about The Chopsticks-Fork Principle, please link here. E-Book Formats for The Chopsticks-Fork Principle: A Memoir and Manual is available as an e-book and can be purchased in Kindle format from Amazon, as well as in ePub format from Barnes & Noble, Kobobooks, and from the Sony Reader Store. It is also available for purchase from Apple's iBookstore. Watch Cathy give her short, TED-like talk, Living and Laughing by the Chopsticks-Fork Principle, at the Rutgers University Big Ideas Conference below! Click here to read an excerpt from The Chopsticks-Fork Principle. On May 17th, 2012, Cathy spoke at The Big Ideas Conference, an initiative advocating for a shift in the professional programming and initiatives used to advance the profession of Higher Education. To watch Cathy's short TED-like talk at Rutgers' Big Ideas Conference click here. In April, 2012, the versatile (and limber) Cathy produced a three-minute video demonstrating stretches and exercises to help strengthen weak knees. Click here to watch Cathy Bao Bean Fixes Your Bad Knees. On November 8, 2011, Cathy was interviewed by Aneeta Sundararaj, author of "How to Tell a Great Story." Click here to read Aneeta's interview with Cathy, which she's titled "Blow Your Own Trumpet!" In May, 2011, Cathy participated in Project Civility at Rutgers. To view this program and Cathy's part in it, click here. On January 18, 2011, Cathy was interviewed by Lili Greene on ICEPN TV. To listen to ICEPN TV's A Special Interview with Cathy Bao Bean please click here. In December, 2010, the Morris County NOW presented Living and Laughing by the Chopsticks-Fork Principle, an interview with Cathy Bao Bean about growing up in a multi-cultural home. To listen to this program,which was hosted by Rebecca Lubetkin, click here. On June 27, 2010, Cathy was Bob Mann's guest on the Humanities Connection, a radio program sponsored by the New Jersey Council for the Humanities and broadcase on WFDU (89.1 FM). To listen to excerpts of Cathy's June 27 program, The Chopsticks-Fork Principle: Multiculturalism and Humor, click here. To listen to an excerpt of a talk Cathy gave at the 2008 NJ Governor's Conference for Women, please click here. 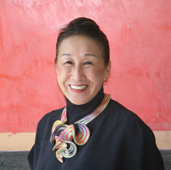 For more detailed information about Cathy Bao Bean, please click here. On June 6, 2009, the Museum of Arts & Design hosted a reception in honor of Bennett Bean's and Elizabeth Rand's Limited Edition Rug Series, which the Museum of Arts & Design commissioned to commemorate MAD's inaugural year at its new New York City location at Columbus Circle. The 9 for '09 Limited Edition Rug Series is on view in MAD's museum store and on its web site. Cathy and Bennett Bao Bean's home is featured in the newly published book The New Asian Home by Kendra Langeteig. Click here to read the Wikipedia article about Cathy Bao Bean. Cathy welcomes the opportunity to speak at libraries, book stores, schools, and other organizations. To contact the author for personal appearances, please call : 908-852-7426 or submit a request by email.